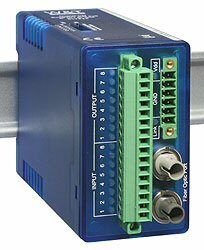 Although digital I/O signals are basically less sensitive to external noise than for example serial data signals due to their lower bandwidth and the large voltage span, application conditions still sometimes require transmission procedures which are completely resistant to noise impinging on the transmission line. Glass fiber optic cables used as the transmission medium meet these requirements in ideal fashion and also offer the advantage of galvanic isolation of up to virtually any value between the connected devices. In installations which are subjected to high risk of lightning strikes, for example in outdoor locations or between distant buildings, such a solution ensures that the connected components will survive even under adverse conditions. The functionally equivalent plastic fiber optic cables offer the advantage of easy-to-install connections over relatively short distances of up to 100 meters, but for segments of up to 3800 m the use of glass fiber optics is essential. Attenuation of the light signals in glass fiber optic cables is disproportionately lower than in plastic fiber optic cables. Whereas routing and assembling glass fiber optic cables used to be problematic for the user, increasingly wide usage of glass fiber optic technology in networks has caused many companies to offer this service today at reasonable cost.